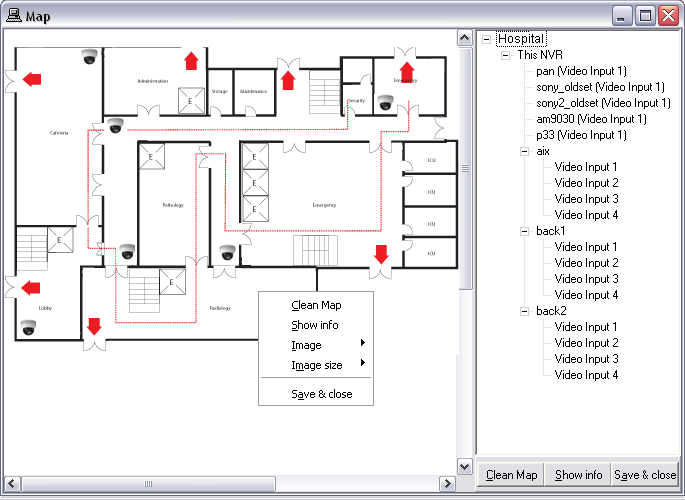 Additional NVR feature is camera location mapping, which overlays camera icons that represent the locations of cameras on a map of a building or area. To easily select a camera, camera icons will be placed on a map that is imported into the NVR. Using a mapping functionality, finding the right camera becomes very intuitive. In the NVR Control Center — General — Camera Locations click Add button under the Cameras Locations list. Enter a new Location Name and click Load Map Image button to choose a map file. When the location map file is selected — Set Map Elements button appears. Click the button to place cameras icons on the map. The map file can be a photo or a drawing in a standard image format such as JPG, GIF, or PNG. Clicking the Set Map Elements button launches a Map page allowing for users to select a camera from the NVR cameras list and place a camera icon anywhere on the selected map. Drag and drop on the map a camera name from the list — a camera icon will appear on the map. The selected camera excludes from the available cameras list. To change camera icon to one of 4 avalable images select Image from the right-click menu. To change icon size select Image Size from the right-click menu. Click Show Info to show camera name next to the icon. Click Save&Close button to save cameras location map and close the Map page. Click Save button under the Cameras Locations list. On the Client Start Page click Map button to launch a MAP page allowing for users to browse and select cameras by location on one or more maps. 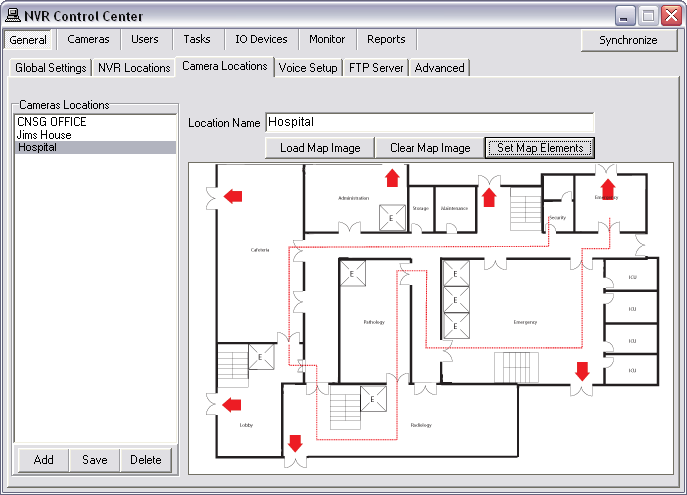 The button is only visible if at least one map location is configured in the NVR with at least one camera assigned to it. 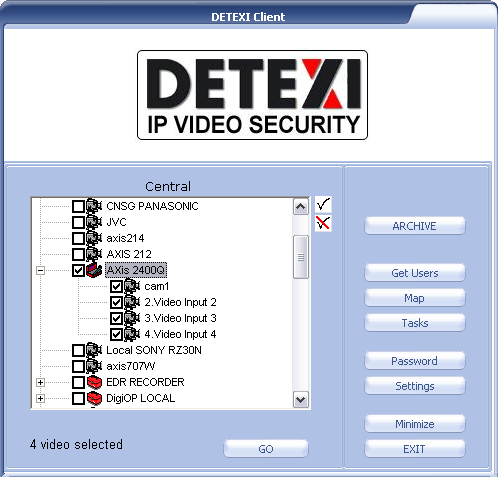 In the Remote Client cameras available in the cameras list and/or maps will depend upon the user logged in permissions. Select a location map from the top right list. To launch a single camera live view — click on a camera on the map. 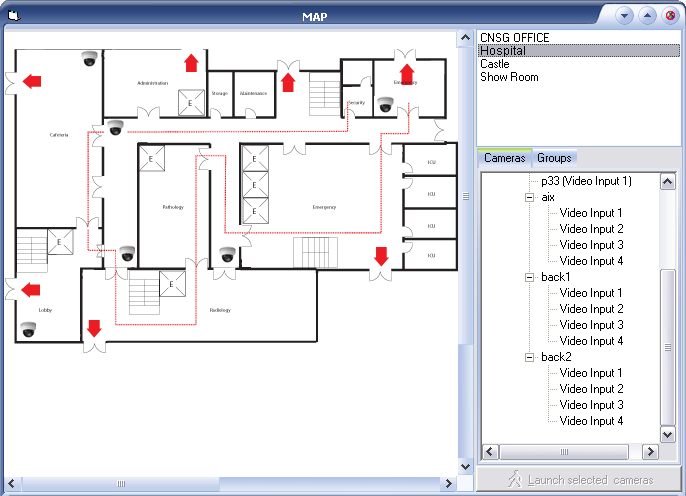 To launch multi-cameras live view — holding Ctrl key click on any number of cameras on the map to select/deselect multiple cameras. Then click Launch selected cameras button below the Cameras list.